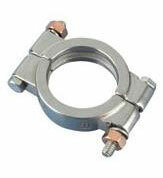 Single Pin Sanitary Hinge Clamps are most popular for easy assembly and breakdown of process lines and equipment. 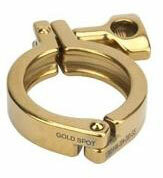 Gold Single Pin Sanitary Hinge Clamps are most popular for easy assembly and breakdown of process lines and equipment. 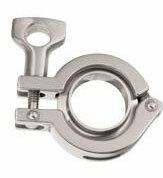 Rubber Fab's Double Pin Sanitary Hinge Clamp is constructed of 304 Stainless Steel. 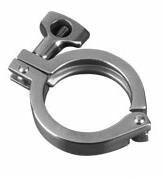 Rubber Fab's High Pressure Clamp is constructed of 304 Stainless Steel. 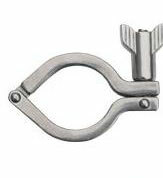 The Biological Indicator Hinge Clamp, made of 304 Stainless Steel, is made to work with the Biological Indicator Gaskets for sampling within the piping system. Each Biological Indicator Hinge Clamp comes with one port. Rubber Fab's Smart Gasket Thermocouple Hinge Clamp provides up to four internal ports for accepting the Smart Gasket thermocouple samples or accessories. Rubber Fab's Spore Trap Slotted Hinge Clamp works with the Spore Trap for collecting samples within a piping system. 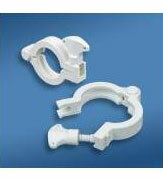 The Spore Trap Slotted Hinge Clamp is available with one port or no port. The Tabbed Orifice Plate Hinge Clamp works with the Tabbed Orifice Plate for ease of reading and placement within a piping system. 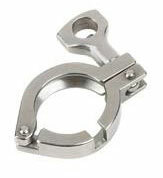 Rubber Fab offers the I-Line Clamp in 304 Stainless Steel. 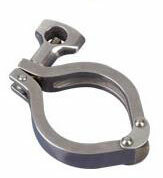 Rubber Fab's Non-Metallic Sanitary Hinge Clamp is specifically designed for use on non metal to non-metal connections!